Perhaps we should start with some perspective: it is early days, the World Cup is still being shaken from a few legs and the Premier League is a marathon, not a sprint. 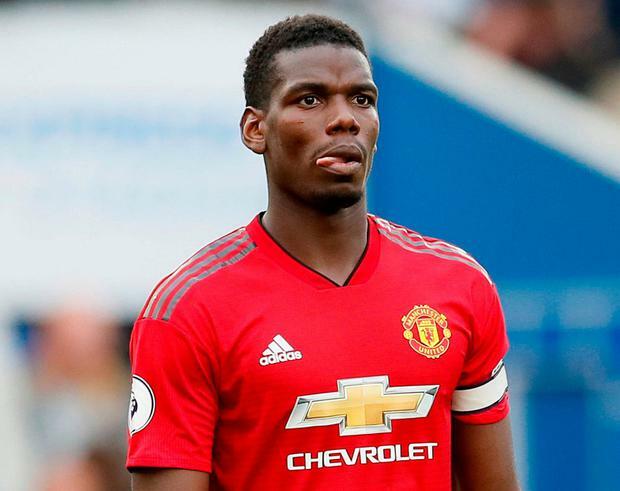 Even so, as Manchester United were well beaten by Brighton on an afternoon when Manchester City won 6-1, it was hard to find any signs of a team shaping to retake their place at the summit of English football in May. Games like this, where a giant visits a relative Premier League minnow, often follow a pattern. There is a spell of early pressure from the home side roused by the occasion. But, as the first-half minutes tick by without a breakthrough, a sensation creeps over the stadium that eventually they will be punished for failing to take advantage, that the beast will stir and wreak havoc. That sensation never took hold here. Not when Romelu Lukaku went through on goal after 10 minutes and skewed wide, or when he scored 20 minutes later, or even as Brighton were pinned throughout the second-half. 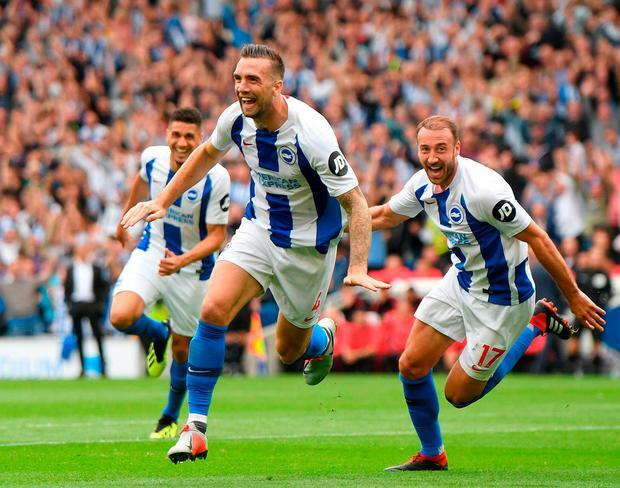 The hosts scored twice in two first-half minutes, through Glenn Murray and Shane Duffy, and, soon after Lukaku's reply, Pascal Gross added a third from the spot before half-time. This was no smash and grab: United simply never looked like mounting the kind of fight which would prise the game from Brighton's grip. 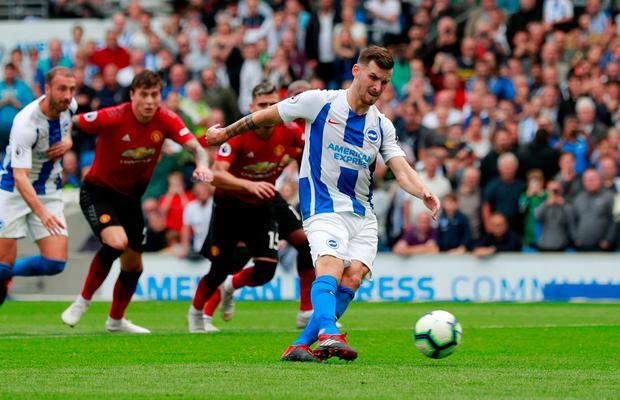 Lukaku's wasted early chance, when through one-on-one with Mat Ryan, had seen Lewis Dunk injured in a challenge by the Belgian, forcing the Brighton captain off. As the game paused, United fans serenaded their manager with hearty refrains of "Jose Mourinho! ", showing their solidarity for a man under scrutiny, but a few minutes later their chants were well and truly silenced by a double blow. Juan Mata had been anonymous on the right of United's front three and the ball travelled straight through him in the build-up to Brighton's first goal on 25 minutes, when Davy Propper picked out Gaetan Bong on the left touchline. Bong found the underlap of Solly March sneaking behind Ashley Young who bounced a low cross along the six-yard box for Murray, a step ahead of Victor Lindelof, to dig the ball past David De Gea from close range. United were rattled and from the restart Bailly quickly conceded a corner under little pressure. Gross' initial cross was cleared, but when Brighton recycled and redelivered, the ball found its way to Duffy's feet and the big centre-half fired home to erupt the Amex. It was all Brighton deserved, so it was a surprise when United hit back a few minutes later. 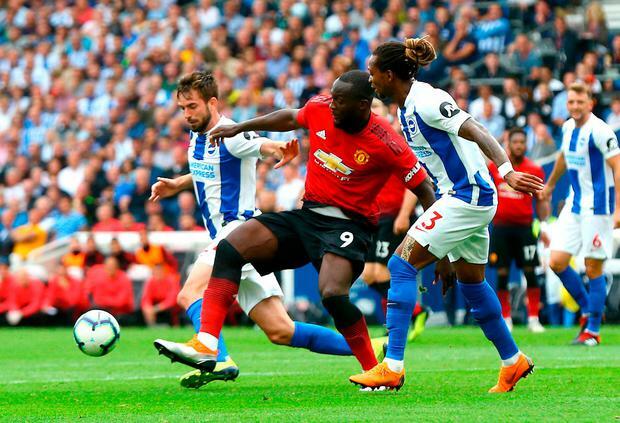 Set-pieces were Brighton's Achilles heel last season and one stung them here; they failed to clear a corner and when Luke Shaw volleyed back into the rabble, Lukaku rose to head home from a couple of yards. However, just before half-time Brighton restored their lead. Fred was caught on the ball in midfield and suddenly players in blue and white were streaming through every channel. Propper picked out Gross surging into the box and Bailly clumsily wiped out the German, who got up to drill the penalty down the middle off a diving De Gea's legs. Mourinho had a reshuffle at the break, dismantling his front three, where the interplay had been non-existent, bringing on Marcus Rashford and Jesse Lingard on for Mata and Andreas Pereira, and switching to 4-2-3-1. United began to control the ball as their hosts retreated, but chances were scarce. Lingard and Rashford brought energy, but little enterprise. Marouane Fellaini entered on the hour and won an injury-time penalty after a clattering from Duffy, which the otherwise quiet Paul Pogba converted, but it was far too late.